I’ve had this screenshot sitting on my desktop for a while because I think it’s quite interesting. 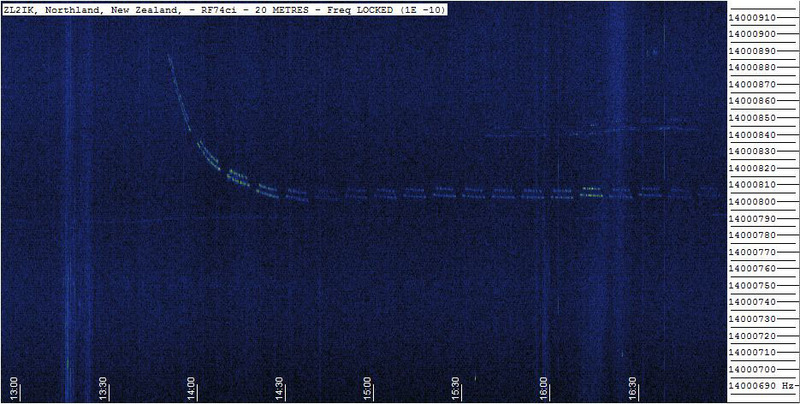 It shows my 20m QRSS signal from when I switched the transmitter on, for a period of nearly four hours. You can see how it takes almost an hour to warm up and calibrate itself to the correct frequency and then it’s nice and stable. This is nothing unusual really, the Hans Summers Ultimate 3 transmitter takes a while to stabilise and end up on the exact frequency. What’s a little unusual is that the station who captured this warmup was ZK2IK, Pete in New Zealand, so not exactly a local station to me. I was transmitting with about 200mW on 20m through my Hexbeam which was pointing due north. It’s quite incredible to see my very low powered transmission was such a good signal on the other side of the world for such a long period. This entry was posted in Amateur radio, Construction, HF, QRSS and tagged Hans Summers, Hexbeam, QRSS. Bookmark the permalink.